National Football League’s Chicago Bears. (in 1940, 1941, 1943, 1946) and five Western Conference titles. Enroute, Luckman set numerous offensive records and was named All-Pro five times—from 1941 to 1944, and in 1947. He also played full-time defensive backfield throughout his career. Luckman was the NFL’s Most Valuable Player in 1943, the year he threw a single-game-record 7 touchdowns against the New York Giants and 28 touchdowns during the Bears’ 10-game regular season. The seven-touchdown spectacular led to a 56–7 rout over the Giants on Sid Luckman Day at New York’s Polo Grounds. Later that season, he tossed five touchdowns in a 41–21 NFL title game romp over the Washington Redskins. yards per pass), and 139 touchdowns. 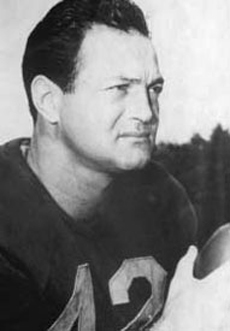 Luckman is a member of the College Football Hall of Fame and was elected to the NFL’s Pro Football Hall of Fame in 1965.